Apple Music is great, but in some cases, you might need to get the music in MP3 format. As we all know, Apple Music M4P files are DRM-protected and it is not simple for you to convert Apple Music to MP3 as it is quite tricky. To turn Apple Music into MP3 or other formats, you need to remove DRM protection first. DRM, short for Digital Right Management, is used by Apple to protect Apple Music, old iTunes songs, iTunes audiobooks and iTunes purchased videos from privacy. The DRM protection brings a lot of restrictions on how you use the files. For example, even though you have downloaded Apple Music songs to your PC during the Apple Music subscription, you will lose all access to these downloaded songs once you stop paying for the service. And you can only listen to the Apple Music songs on authorized Apple devices and PCs. A hassle-free solution to get rid of all these restrictionsis is using TuneFab Apple Music Converter, an Apple Music DRM removal to unlock DRM and then convert Apple music to MP3. As you know, MP3 is the most popular and welcomed music format which is widely supported by many media players and portable devices. Is it Legal to Get Rid of DRM from Apple Music? If you subscribe to the Apple Music service and pays for the music you listen to, you technically own the music you pay for and you can keep all downloaded songs forever. But it is only available for your personal usage. For example, if you want to enjoy downloaded Apple Music tracks on non-Apple devices or third-party media players, you need to remove DRM protection first. But we do not encourage removing DRM protections of Apple Music or other digital songs to steal music or use the songs in commercial way. In this guide, I’ll show you how to get DRM-free version of Apple Music songs for personal usage with a powerful DRM removal software. On the top, there’s the “Menu” section for you to conduct different features, such as “Refresh”, “Options” and “Convert”. On the left side of the main interface, you will see the “Playlists” section. All your Apple Music playlists are listed for you to preview. 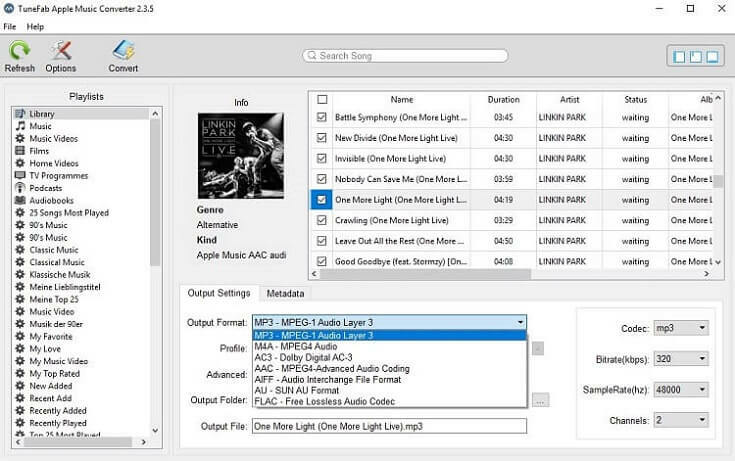 When the specific playlist selected, all the songs inside will be listed on the main interface of the software. At the bottom of the main interface, you will see the “Output Settings” and “Metadata” section. You can customize the output format, output folder, output bitrate, sample rate, and more in the “Output Settings” section. What TuneFab Apple Music Downloader Can Do? As you can see, the brilliant Apple Music downloader – TuneFab Apple Music Converter has an intuitive interface and you can clearly know where to click to have your Apple music converted. 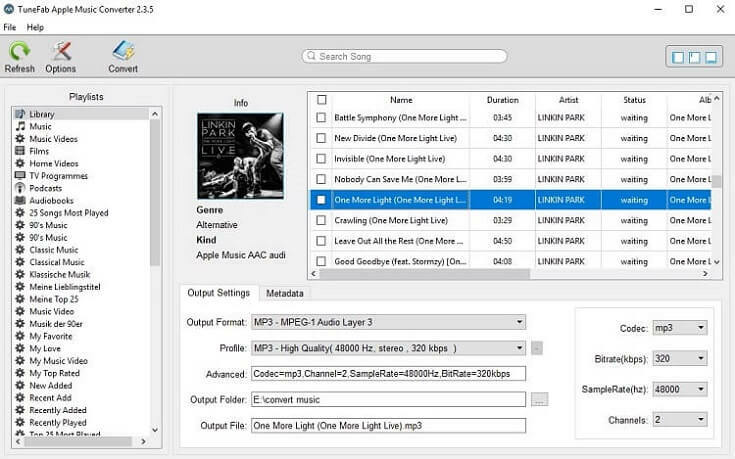 Moreover, you don’t need to manually add the songs into the software one by one. TuneFab Apple Music Converter is able to import all your iTunes songs automatically. All you need to do is to make sure that you have installed the latest version of both iTunes and TuneFab Apple Music Converter. If you are trying to convert Apple Music, you might need to have an available Apple Music subscription. Unlock DRM from Apple Music, iTunes M4P songs, iTunes audiobooks, Audible audiobooks, etc. Select MP3, AAC, AC3, M4A, M4R, AIFF, FLAC, etc. as an output format. Convert AA, AAX or M4B audiobooks with chapters preserved. Edit ID3 tags if needed, including title, artist, album artwork, genre, year, and more. Play Apple Music on multiple devices such as MP3 player, iPod shuffle, iPod classic, iPod nano, Android tablet, Zune, etc. Convert protected music and audiobook with 16X faster speed. Download and install TuneFab Apple Music Converter on your computer. When the installation is done, you can launch the software by clicking at the software icon. When you launch TuneFab Apple Music Converter, iTunes will be activated automatically because TuneFab needs to work with iTunes. All your iTunes playlists including music, audiobooks, music videos, etc. will be displayed in the main interface of the program. If you are a free trial user of TuneFab Apple Music Converter, you can only convert the first 3 minutes of each file. But there are no limitations on how many songs can be converted with the free trial version. Please note that the only difference between the full version and free trial version is that, free trial user can only save the first 3 minutes of the song. To unveil all features, you will be asked to unlock the excellent Apple Music converter by entering the activation code. Note: You will get the activation code after purchasing the software. Copy and paste the code in the blank and click “Unlock”. Regularly, TuneFab Apple Music Converter will detect your iTunes Library and import Apple songs, videos, podcasts automatically into the “Playlist” section. If it doesn’t show up, choose “Refresh” to update the iTunes Library. As shown in the software interface, you can preview the Apple Music songs and choose all those songs you want to remove DRM from by ticking the box next to the songs. It is intuitive, isn’t it? You can select multiple songs at a time, and you can select the whole playlist at one click if you like. Now you can go to the bottom of the main interfaceto set up the “Output Settings”. Hit on the “Output Format” section and you can see different music formats listed in the drop-down list. I prefer choosing MP3 as the output format because it is the most universally used music format. You can also customize “Codec”, “Bitrate”, “SampleRate” and “Channel” as well. But to make things easier, I usually keep it as it is and move on. If you want to convert your Apple Music songs with high quality, you can choose M4A as the output format, and set the bitrate as 256 Kbps (which is the original bitrate of Apple Music song) and select 41,000 Hz as the sample rate. 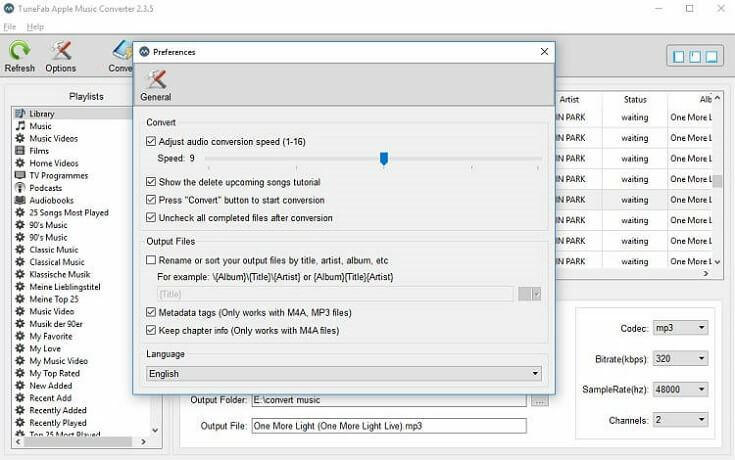 For those who need to convert a large number of songs or want to convert long-hours audiobook, you’d better choose a faster conversion speed to speed up the converting process. TuneFab Apple Music Converter for Windows supports 1X to 16X faster conversion speed. If you are Mac user, then you are out of luck because the Mac user is limited to convert songs at 1X speed. Note: You can go to “Options” > “Preferences” and drag the tab to modify the conversion speed. Now that everything is well prepared and what you need to do now is to simply hit on the “Convert” button on the top to start the Apple Music to MP3 conversion. 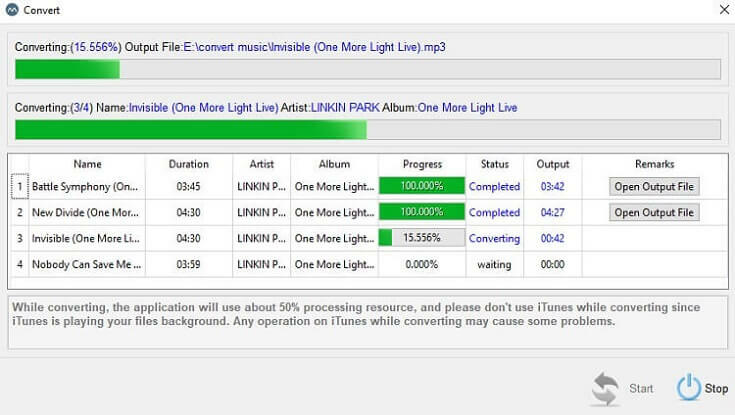 The converting interface will pop up and shows you the converting progress of each song. You can stop or pause the converting process any time you like. When a song is converted successfully, you can click at “Open Output File” to get the converted song. By following the steps mentioned above, you can easily remove DRM and convert Apple Music to your desired audio formats. As I mentioned above, the full features of TuneFab Apple Music Converter are only available if you purchase and activate the software successfully. If you think TuneFab Apple Music Converter is useful to you, you can get the full version from its official website. With the simple clicks on the interface, you can have more than thousands of songs converted into MP3 format. No more worries on the DRM issue, and no quality loss during the conversion.